Never house closely related individuals with each other, because rivalry runs strong in the green singer finch. Unwanted breeding between closely related individuals should be discouraged to avoid birth defects. Wash all food and water bowls daily. Clean the cage every other day to reduce the risk of disease. Captivity breeding of green singers needs to be encouraged because the small finches are becoming quite rare in their wild habitat. They have been placed on Appendix III of CITES. They are considered to be endangered. Birds who are listed on this list can no longer be imported into the country because of their diminishing status in the wild. 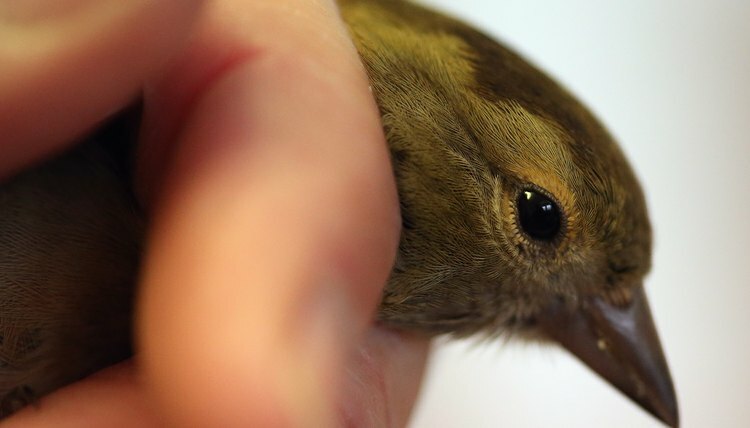 The green singer finch is a small African relative of the canary. Only the males sing in a beautiful lilting voice. Males and females resemble each other, but the females tend to be duller in color. Green singing finches require privacy when breeding. They can also become extremely aggressive and territorial during breeding season, so house only the male and female together. The finches are quite hardy and long-lived. Average lifespan can easily top 20 years. They also tame easily and make wonderful companions. Green singers have strong breeding instincts that need to be addressed, even as pets. Breed green singer finches when they reach 12 months old. Breeding season begins in March and can run through October. The birds will breed at any time during these months. Place the breeding pair together in a cage. Feed them fresh grass seed. Milk thistle and chickweed are also recommended. Fresh clover with the roots still attached is good to add during breeding season. Feed a good songbird seed mixture that contains niger seeds. During breeding season feed the birds termites, maggots and meal-worms. The birds will also consume live injured flies. Feed small amounts of live food. Too much can upset the finches' digestive tract. Green singer finches adore mashed hard-boiled egg. Always supply a cuttlebone and grit. Watch for signs that breeding is imminent when the male begins to dance around the female. He will also try to feed her bites of food. The male will also sing persistently to her. Place canary nest baskets in the cage with the green singer finches. Green singer finches prefer a cup-style nesting basket and they like it placed high in the cage or aviary. Provide ample nest material such as dried grasses, feathers, coconut shell fibers and even small twigs. Horse hair can also be used but never use mane or tail hair. Only use body hair. Mane or tail hair can easily become wrapped around a tiny leg and cause damage. Watch for the female to begin spending time in the nest cup. She will lay two to four eggs. Incubation period is 13 to 14 days. The young will be full fledglings at 21 days old. The young should stay with their parents until they are five weeks old and then be removed. If the parents mate again they can become territorial toward their older young. The young green singer finches can also become destructive toward the nest of their parents.